Junglee Rummy has an amazing promotion to make each and every player of them smile. 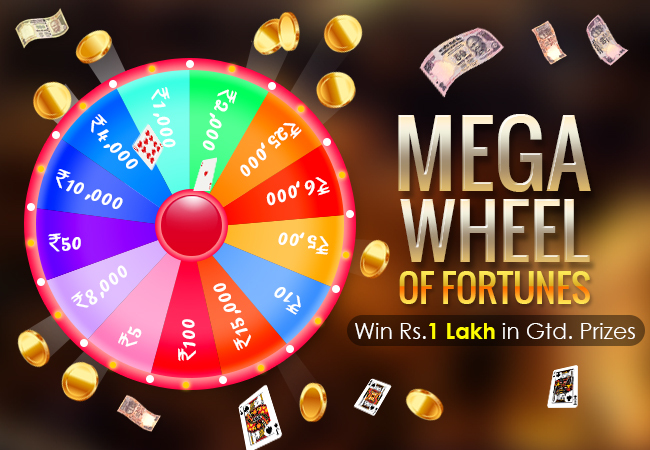 This November, they are bringing the Mega Wheel of Fortunes promotion which will make you spin the wheel and win Rs.1 lakh in cash prizes. In order to take part in this amazing promotion by Junglee Rummy, you need to make a minimum deposit of Rs.100 and play maximum games during the promotion period. At the end of the promotion, a Mega Wheel of Fortune will appear and you just have to spin it to reveal your surprise cash prize! The promotion has started on 1st of November and will end on 14th November at 23:59 hours. Only the players who play in the promotion period are eligible for the cash prizes. You need to update your valid e-mail id and contact number before joining the promotion. We wish you all the best with spinning the wheels! To know more about Junglee Rummy website, you can visit our Online Rummy Reviews category in our website. We welcome you to post your ideas, suggestions and feedback on our rummy articles. Your suggestions help us get the best news out of the online rummy world.